Soil particles containing PAHs can adhere to skin and lead to exposures by dermal absorption. Although this guidance focuses on oral bioavailability, dermal absorption of PAHs can be important for assessing potential cancer risks, both systemically and at the site of contact on the skin. Using standard USEPA default exposure assumptions for oral and dermal exposures to soil, together with the current oral cancer slope factor for the index PAH, BaP, the ingestion route of exposure accounts for 72% and the dermal route of exposure accounts for 28% of the calculated cancer risk from systemic exposure due to direct contact with PAHs in soil. Currently, toxicity criteria for site-of-contact risk from dermal exposure to PAHs have not been established. If these values are available in the future, they should be considered in a dermal risk assessment. Initial data suggest that some of the same factors (desorption mechanisms) that control oral bioavailability of PAHs from soil are likely to affect dermal absorption as well (Xia, Gomez-Eyles, and Ghosh 2016; Peckham et al. 2016; USACE 2016). Although many studies have investigated the toxicity and absorption of PAHs from topical application, fewer than 20 studies have specifically evaluated the potential for dermal absorption of PAHs from soils. Of these, most of the studies have been performed in vitro, using either excised human skin or animal skin from rodents or swine (Ruby et al. 2016 summarizes the studies conducted through 2011. Peckham et al. 2016, (Xia, Gomez-Eyles, and Ghosh 2016), and USACE (2016) provide more recent evaluations. Three studies evaluated dermal absorption of PAHs in vivo, using tritiated- or 14C-labeled PAHs. The USEPA default value of 13% for dermal absorption of PAHs from soil is based on an in vivo study using rhesus monkeys (Wester et al. 1990). The protocol used in this study conservatively estimates dermal absorption of PAHs, because the study used sand freshly spiked with BaP in solvent. Site-specific investigations can be designed to reduce the uncertainty associated with the USEPA default dermal absorption rate for PAHs from soil. In vivo studies indicate that urinary metabolites of PAHs might be used to evaluate dermal exposure to PAHs. Whole animal studies are useful in providing data on the overall bioavailability and metabolism of PAHs by the dermal route of exposure; however, the flux (absorption over time) of PAHs across the skin barrier is more difficult to measure with in vivo research methods. Because the state of the science on dermal absorption of chemicals is moving toward expressing absorption as flux (Spalt et al. 2009) (Kissel 2011), the application of in vitro methodologies for assessing dermal absorption of PAHs is described below, along with established means to evaluate chemical flux and dermal absorption rates. Unlike the in vivo studies, the in vitro methodologies are generally based on established methodologies for evaluating dermal absorption of organic compounds such as the Organisation for Economic Co-operation and Development (OECD) Guideline for the Testing of Chemicals: Method 428. In vitro dermal absorption studies provide information on chemical flux across the skin barrier (chemical mass per square centimeter per hour; for example, ng/cm2-hr), which serves as the basis for calculation of a dermal absorption factor. Diffusion cells are used to measure flux in in vitro studies. Table 8-4 summarizes principal in vitro studies focused on dermal absorption of PAHs and effects of soil matrices on absorption. A summary of studies appears as supplementary information in a recent paper by (Ruby et al. 2016; Table S5). In vivo dermal exposure studies are complex and the variations in testing conditions have added to the confusion regarding dermal bioavailability of PAHs. The elements that must be addressed when designing an in vitro dermal absorption study include the skin model used and its preparation prior to testing, the receiving fluid used, the experimental design, and the preparation of the soils tested. These element are discussed separately in the following sections. Human skin is generally a better barrier to absorption of chemicals than animal skin.…Whenever possible, Kp values from studies in which human skin is used were given the greatest priority. Some concerns over the barrier characteristics of cadaver skin have been expressed; however, availability of viable skin is subject to supply from surgical centers. Fresh-frozen skin offers a longer shelf life and inactivates the metabolic properties of viable skin. Skin preparation is also a consideration for the study design. 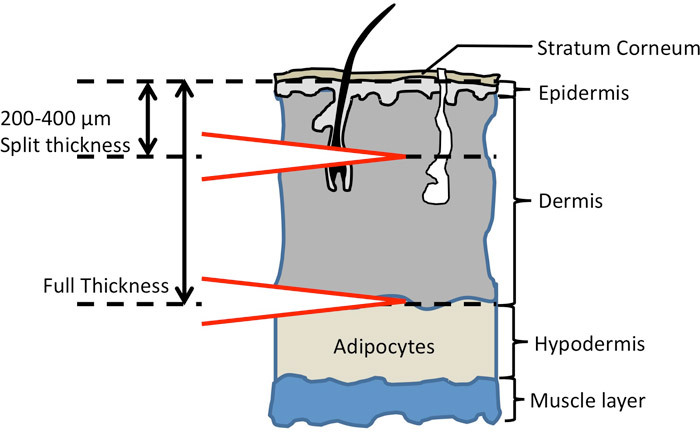 Figure 8-2 illustrates skin preparation for study design. Full skin and split skin models have been presented in the literature. Split skin has cutaneous layers stripped away, leaving stratum corneum, epidermis, and dermis. The cutaneous layer is under aqueous conditions in the test cell and can bias dermal absorption results for lipophilic compounds. Finally, skin samples can be tape-stripped at the end of the testing duration to remove the stratum corneum and any residual particles. Figure 8‑2. Illustration of skin preparation for study design. Dermal studies presented in Table 8-4 principally have skin samples that include the stratum corneum. Typically, however, PAHs bind to components of the stratum corneum and become unavailable for transport through the skin to systemic absorption. Removal of the stratum corneum at the end of the testing duration removes the surface-bound PAHs from the system leaving only the PAHs in the dermal layer and the receptor fluid. Therefore, tape stripping is a tool for study of lipophilic compounds such as PAHs when binding to the stratum corneum is anticipated and systemic absorption is the exposure endpoint of interest. The receptor fluid of the in vitro testing chambers should be prepared with a surfactant so that the fluid does not act as a barrier to PAH absorption. Without a surfactant, PAH absorption is underestimated. Examples of surfactants that have been included in research to date include fetal bovine serum (fbs) and polyoxyethylene (20) oleyl ether. An equivalent surfactant can also be used. The experimental design depends on the goals of the study, but should include consideration of issues such as PAH source and concentration, degree of weathering, soil characteristics, soil particle size, soil loading rate, exposure duration, test duration, and receptor fluid sample collection frequency. Typically, a 24-hour exposure duration is consistent with the exposure period presented in Wester et al. (1990) and so may allow comparison of data against the USEPA default value of 13%. Testing duration for in vitro studies is largely related to the length of time that the skin sample can maintain its barrier characteristics. Sampling frequency is generally based on the goals of the investigation. Close time points (2- to 4-hour intervals) are recommended in the first 24 hours, with larger intervals between sampling events common for tests with extended duration. Proper soil preparation is critical to high-quality dermal bioavailability measurements. In particular, the particle size distribution of the soil samples tested and the soil loading rate are key variables that can strongly affect the results. The particle size fraction should be consistent with the exposure scenario of interest; generally this is the fine particle size fraction that adheres to the skin surface (for example, USEPA 2016e recommends sieving to use the <150 um particles ). If results are reported as flux, as described above, then the soil loading rate on skin (mass of soil per unit surface area of skin) becomes irrelevant. However, if expressing absorption in terms of percent absorption, then it is important that the soil loading not exceed a monolayer of soil over the skin surface, as described in Exhibit C-4 of USEPA (2004). The monolayer includes a sufficient source of PAHs to provide a reservoir of contaminant available for absorption; however, it is sufficiently small to allow for contact of PAHs with the skin surface. The larger the particle diameters, the greater the mass of soil in a monolayer. Use of in vitro dermal absorption studies for evaluating dermal bioavailability of PAHs is still considered a research effort, with no regulatory accepted procedures in place. The information presented here summarizes some important considerations for these studies, but not detailed methods or prescriptive study design.